"(MGM, 1939) When David O. Selznick was preparing Gone With the Wind, he gathered together some of the most talented cinematic artists in Hollywood at the time, realizing that the film would need a number of effective matte paintings to save on costs and embellish the elaborate sets. The team of artists consisted of photographic effects supervisor, Jack Cosgrove, Albert Simpson, who was skilled at blending mattes with live-action components, and Fitch Fulton, who later worked as an uncredited matte artist on Citizen Kane, and on the technical staff of Mighty Joe Young. Fulton is probably best remembered as a talented landscape painter, focusing on Southern California and the Sierra Nevada, and as the father of effects man John Fulton. It was Fitch Fulton and Albert Simpson who sketched the mattes for Gone With the Wind on thirty-by-forty inch Masonite boards, providing Tara with walls that were never built, bringing Atlanta back from the devastating fire, and rendering the many realistic details that brought the Civil War era to life on the screen. There were more than one hundred shots in Gone With the Wind that incorporated matte paintings. When it came to the matte work for the opening credits in the film, Fitch Fulton was the artist who came up with the concept based on the research, paintings, sketches and original architectural plans supplied by Kurtz, Cosgrove, Simpson, Menzies and others on the art department team. Offered here is the original production master painting of Tara by Fulton, executed in oil on Masonite with rich, vibrant color worthy of this important subject. 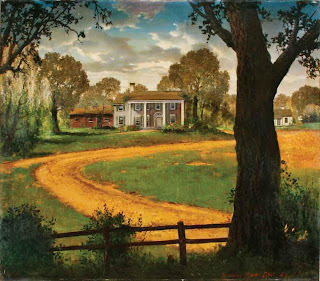 In this painting, Tara is presented as a sprawling estate on a working plantation in the Old South, set behind a tree with a neatly kept path angling up to the door. This is the master concept artwork of Tara, and the original design from which the matte paintings were then rendered. It differs slightly from the final matte paintings, which were sketched using an entirely different process with pastels on chalk board and featuring a large black area where the actors could be inserted. The painting is inscribed at the lower right by Fitch Fulton, “To John from Dad 43”, at the time he presented this painting as a gift to his son, John. An incredibly important piece of original artwork from the film, this production master painting is one of the finest artifacts to have survived the 60+ years since the release of Gone With the Wind. Measures 36¼ in. x 32¼ in. Provenance: From the estate of Fitch Fulton." While it may be a sad thought that the original matte painting was sold by the estate of Fitch Fulton, the lighter side is it must be hanging in one rich person's room taken cared of. Scarlett would think otherwise though: "I can't let Tara go...while I've got breath in my body." Land is the only thing that matters as Gerald O' Hara would put it. Wow I completely ignored that ! Thank you for sharing this, the image and the info about the matte-paintings... And your new Scarlett with the painting behind... Just absolutely great !!! Thank you my friend Eric. Yes, I chanced upon this while looking for the painter of the Blue portrait painting who I can't seem to find anywhere. Glad you like the portrait. 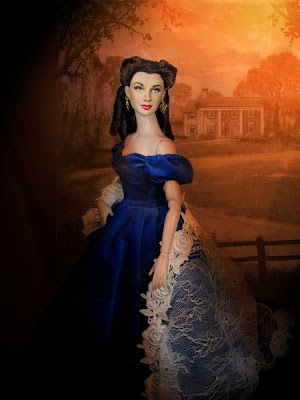 Not much to do with GWTW doll, so I figured might as well improvise. Thanks Eric!!! Have a nice week!! !